As Big Finish approaches its monumental 200th Main Range Doctor Who release, the company has commissioned a trilogy of stories that pairs Doctors with past incarnations’ companions. Beginning with ‘The Defectors,’ Jo Grant and her inexplicably-changed Doctor arrive on Delphin Isle on a matter of national security as they learn of a highly classified incident dating back to the Cold War. As secrets manifest and bodies mysteriously appear in the harbour, the Pertwee and McCoy eras impressively collide. The crux of this concept is developing a story that feels like it comes from the earlier Doctor’s era, and the incredible atmosphere of Delphin Isle and the mystery of its oddly-acting locals certainly manage to evoke the core essence of the Third Doctor’s Earth-bound tales. Indeed, McCoy seems perfectly at home in this type of story that has so rarely been afforded to him, the secrecy of the Seventh Doctor complementing the burgeoning mystery of Delphin well. Indeed, Jo Grant acts as a stand-in voice for the Third Doctor, highlighting the different courses of action that these two Doctors take and keeping the tale true to her time on the programme. Katy Manning manages to evoke the youthful exuberance of Jo perfectly even if the script fails to capitalize on the idea of her being a capable and seasoned addition to UNIT, instead writing her as the more naïve character from the start of her tenure. Richard Franklin is used rather sparingly as Mike Yates, but his presence does help to flesh out this era further while still allowing the focus to remain on the Doctor and Jo. Unfortunately, the lack of a true UNIT presence is very noticeable even if understandable, and the constant discussions about the Brigadier may be disconcerting to some since no payoff can come from them. Not every Pertwee tale featured UNIT, of course, but this tale does so much to entrench itself in UNIT lore that it feels like a missed opportunity to not have the earlier version of the group more overtly present in some meaningful form. There are some stunning visuals peppered throughout the story as the truth behind the aliens’ desires to escape Earth become known, and the sound design excellently unifies the two distinct eras, but there are also far too many padded scenes where nothing of consequence really happens and missed opportunities both for the Doctor to truly examine the ethics of himself and of those around him and for Jo to act on her suspicions about this new Doctor. However, the Seventh Doctor remaining true to himself even as he collides with his previous life is immensely pleasing, especially as events come to a head in the final episode. It’s a shame that the truth about why the Doctor has been temporally displaced can’t be explained here, but it certainly creates a fascinating air of mystery heading into the next two stories. 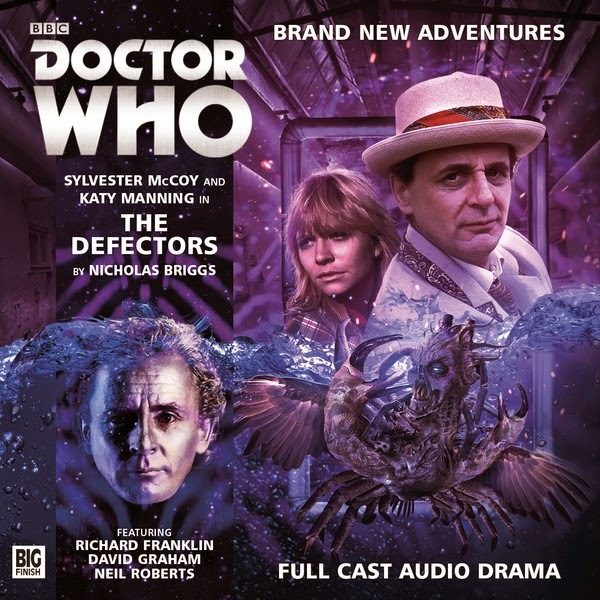 ‘The Defectors’ is a solid opening to this trilogy of so-called locum Doctors with its incredible atmosphere and visuals, but it does seem at times as though the script is content solely to have Sylvester McCoy and Katy Manning together, missing a chance to create something altogether deeper and more satisfying. Though the lack of UNIT is unfortunate, the Seventh Doctor’s foray into his Third incarnation’s life certainly manages to highlight how similar and incredibly different these two versions are, and that alone makes ‘The Defectors’ a worthy listen.